You work hard to provide for those around you and keep your life in order. When your flooring is dirty and stained, does it feel that way? 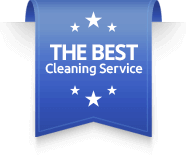 Regular carpet cleaning is not just a necessity; it’s a reward to showcase your little victories in life. Angie’s technicians will do walk through of the house, noting any areas of concern or special stain treatments that may be needed. If there are pets, the technician will use a UV blacklight to determine if there are any hidden pet urine issues that need to be treated. The technician will then discuss the work, service options and get approval to before cleaning. Specific spots and stains will are pretreated with the appropriate spotters and treatments. Spots and stains from red juice, pet accidents, food spills or rust spots. Our spotters are specifically designed to treat each type of spot. Our spotters work better than store-bought products and will not leave heavy residues. Once the spots and stains have been addressed, the rest of the carpet surface is sprayed with a pretreatment. The pre-spray breaks up soils from foot traffic like dirt and grease. The technician will spread the pre-spray with a carpet grooming rake. The grooming rake evenly spreads the solution to all sides of the carpet fiber. It also agitates the carpet fibers to loosen trapped dirt. We extract the dirt and cleaning solution from the carpet with hot water at 220-240 degrees Fahrenheit. The dirty water is sucked through the wand and out to our truck. 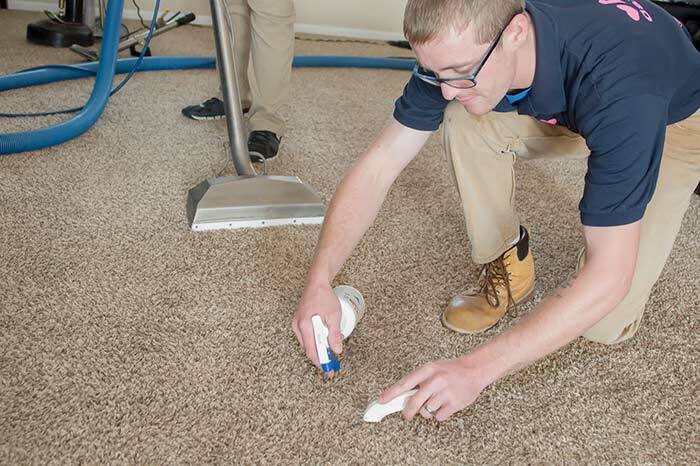 Our technicians are trained to perform extra drying passes over the carpet to ensure that carpets are slightly damp, but not soaked. After extraction, we can apply Scotchgard Carpet Protector. Scotchgard helps to repel food-based spots and spills. It also repels dry soil, which makes your vacuuming more effective. When we apply Scotchgard, our customers receive a 12-month spot and spill warranty. Ask your technician for details. As a finishing step, we groom the carpet fibers with a carpet grooming rake. The grooming makes the carpet stand up tall, which also helps the carpet dry faster. Many other companies do not groom the carpet. They leave the carpet with a “V” or “shark tooth” pattern. The V-pattern many times is used to camouflage the spots the other carpet cleaners could not get out. 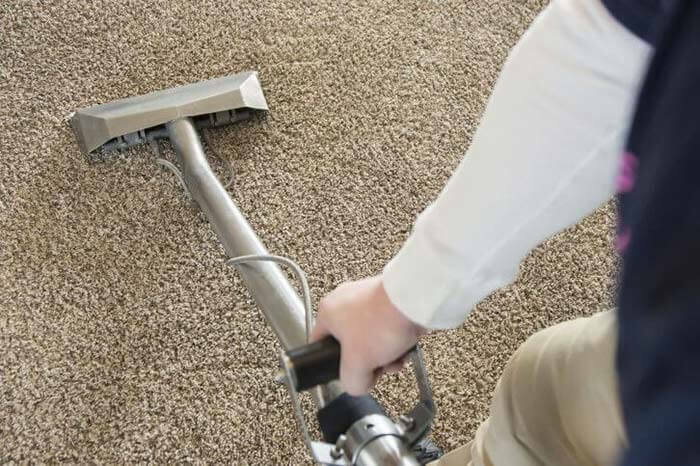 At Angie’s Carpet Care, we prefer to groom the carpet into a plain field of tall carpet fibers. 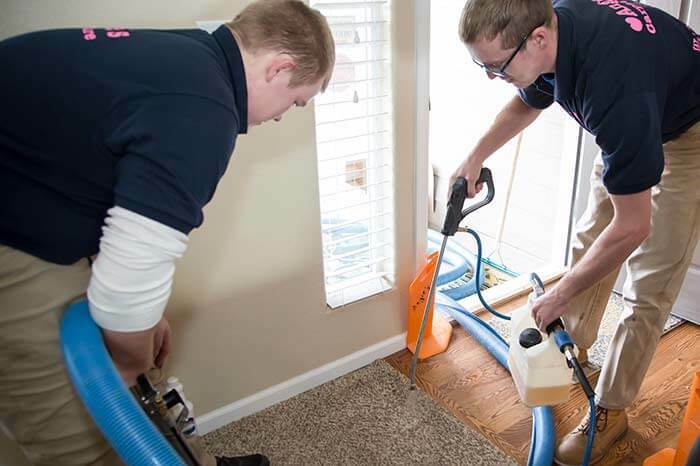 Finally, after a room is completed, our technicians will set up a carpet drying fans to help speed the drying process. We may also turn on any ceiling fans to help. On warm days, we may open windows to increase the airflow through the house. We serve businesses throughout Colorado Springs. We can handle any size business, from restaurants to multi-level hotels. Give us a call for a commercial quote for your specific business. We do not just guess where the problem is – we use UV light to review your carpet to look for hidden stains, pet urine spots, and other common problems hiding within your carpet fibers. Angie’s Carpet Carpet provides extra passes with the carpet cleaning wand after our carpet cleaning process. This helps to extract more moisture from the carpet and helps it to dry faster.